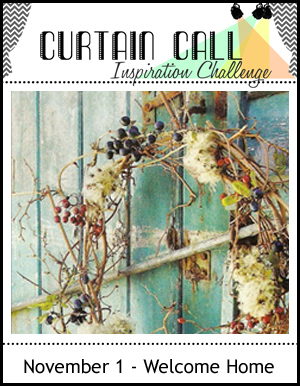 The Curtain Call Crew wants to thank Paper Issues for sponsoring for Curtain Call Inspiration Challenge: Welcome Home! The Welcome Home entries were beautiful! Thank you all! Congrats! 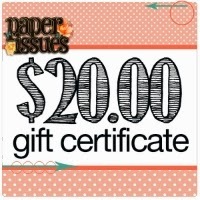 Email Stacey (slschaf771@aol.com) to accept your Paper Issues gift certificate! 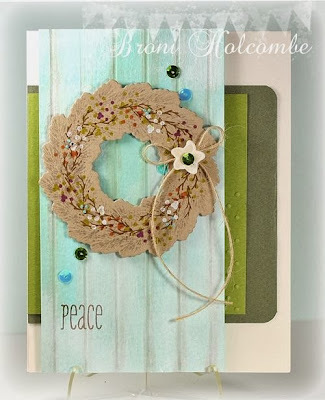 "Love the delicate blue wreath on Lai-Yoke's card and the glitter paper she used. The two-toned greeting is the perfect touch!" 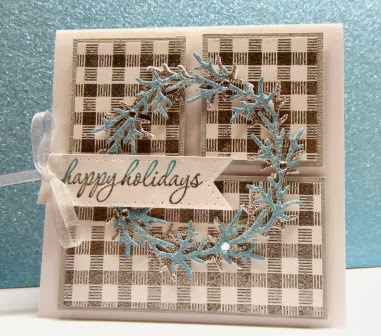 "Love Lai-Yoke's card with the blue twig branch against the gingham and her two toned sentiment is fabulous!" 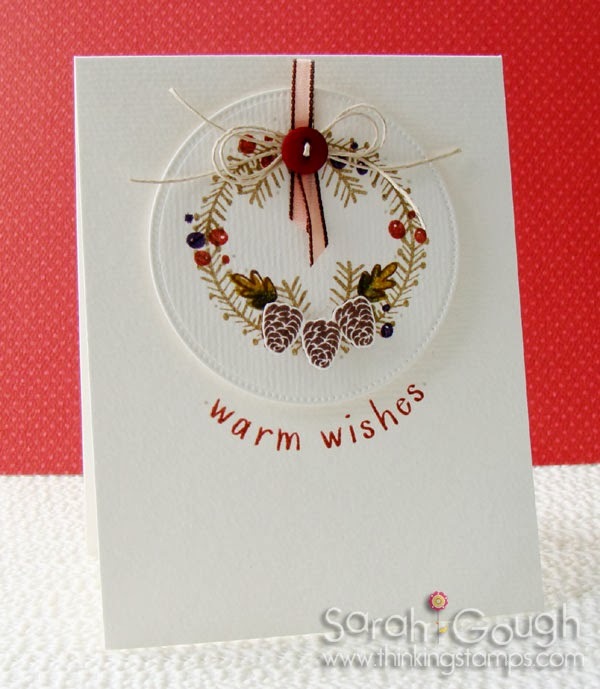 "I love the beautiful embossing and the delicate wreath on the front of Lai-Yoke's card. Lovely inside and out!" "I adore Toni's design! 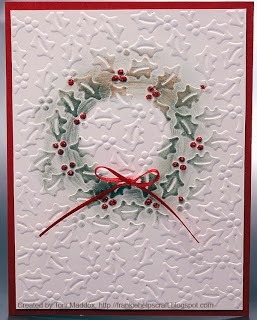 An embossed panel of holly leaves becomes a wreath with a bit of ink and a simple bow. Genius!" "I love Cheryl Lea's card. The richness of the blue background and the texture in the wreath is absolutely amazing!" 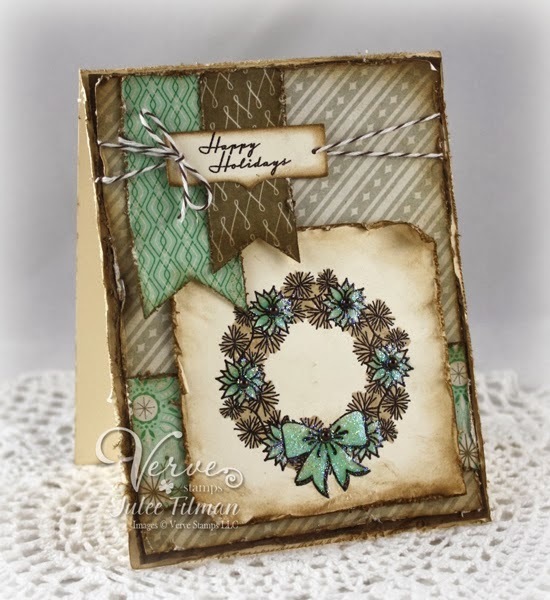 "Julee's card is a beautiful take on the challenge! The distressed papers and rustic colors are wonderful...not to mention that a little Verve is always a perfect choice!" "I love the picket fence that Tracey created on her card!" "I love Broni's gorgeous berry colors on the kraft wreath...totally yummy!" "I love Sarah's card! The wreath is gorgeous along with that ribbon and twine detail!" "I love Shirley's card! I love that she used buttons for her wreath! Genius!!" You won't want to miss our new challenge tomorrow! It's incredible, especially for all of you CAS lovers out there...and we have a FABULOUS new sponsor that we're teaming up with! Doing the happy dance! Thank you for choosing my card! 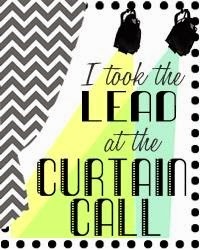 Congrats to all Show Toppers for their wonderful and inspirational projects! What a wonderful group of talent, so honored to be included! Thank you! Thanks for including my card as a Show Stopper, and Congrats to all the winners! The cards all look amazing! 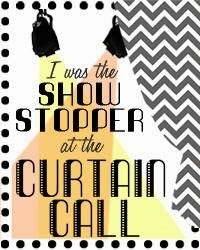 Oh, wow, thanks so much for naming my card one of the Show Stoppers! Really everyone's entries were show stoppers--very inspirational! Boy, this is really a fun challenge. And everybody really made gorgeous cards.